A tame budgie will be a loving companion. While budgies are playful, inquisitive and typically fond of human interaction, some of them are sold as untamed birds. The taming process requires a few weeks and lots of patience. Profusely intelligent, budgies will give you hours of entertainment and laughs, especially when tame and used to your affections. Place your budgie's cage in a busy room of the house. A family room, kitchen or similar area is ideal because the budgie will get used to being around human interaction, hence jump-starting the taming process. Sit beside your budgie and go up to the cage and talk to him several times a day. This helps the budgie get used to you before you start trying to handle him. Allow your budgie to get comfortable in his new home. This may take about two weeks. Your budgie is comfortable when he starts playing with his toys, eating his food and moving around his cage freely, as opposed to sitting frozen on a perch or acting restless. Place your hand in the cage with your index finger pointing out. Don't move your hand toward the bird, simply try to leave it as still as possible for approximately 10 minutes. Don't be surprised if your budgie is scared and starts clinging to the sides of his cage at first. Repeat this for several days until your budgie is used to your finger being in the cage. 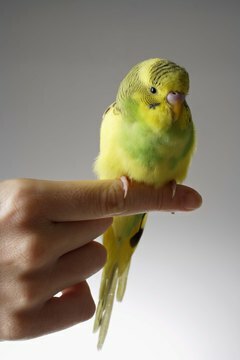 Place your index finger on your budgie's chest and gently push it upward to encourage your budgie to step on your finger. Talk soothingly to your budgie as you allow him to sit on your finger for several minutes. You could sing a lullaby or simply talk about anything and everything while keeping your voice low and soft. Try taking your hand out of the cage with your budgie perched on your finger. At first the budgie may flutter back into the cage; keep repeating the process by gently moving your hand toward the door until the budgie is comfortable. Take your budgie into an unfamiliar room where his cage is completely out of sight. A small bathroom or similar room is ideal. Talk to your budgie while in the unfamiliar room and let him explore if he feels like it. Return your budgie to the room where his cage is and allow him to either stay on your finger or go back into the cage. Continue talking to your budgie throughout the process. Repeat this process a few times a day for several days until the budgie is as comfortable on your finger and in your presence as he is in his cage. Because they are so intelligent and playful, budgies yearn for human interaction once tame. If you travel frequently or have late nights, consider skipping the entire taming process and getting your budgie a companion for his cage. Your pet may endure psychological problems if he is unable to get enough attention from his human counterparts. Have your budgie's favorite treats on hand during the taming process. Give him a taste of the treat to let him know you are not there to hurt him. What Is a Lutino Parakeet?